TrueGrips work well on the back of Leaves Galore Templates to prevent having your template slip. 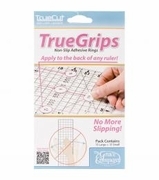 This increases the accuracy of your cuts. Every leaf will come out the exact same size.